Happy New Year 2013! 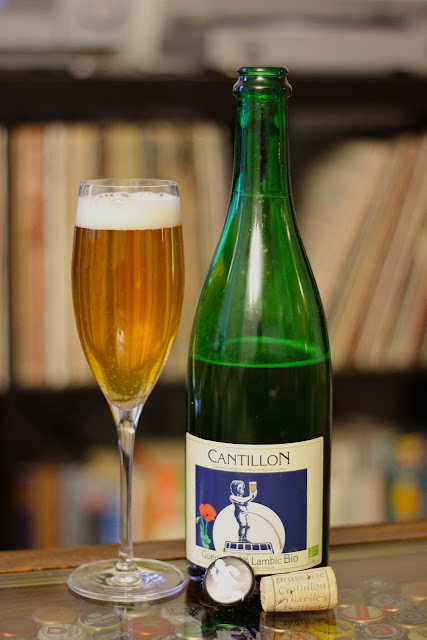 In celebration I'm posting my review of the true Champagne of Beers, Gueuze, and specifically, the world-class Gueuze from Cantillon. The signature beer from Cantillon, their Gueuze, pours a medium-straw body with a honey golden glow. A small stream of bubbles rise gently in the glass for the entire life of the beer. The natural carbonation from bottle refermentation creates a smallish off-white head of foam. After a short period of head retention, a thin layer of foam remains. No substantial lacing forms while drinking this Lambic beer. This Gueuze's nose is supremely funky. The leading sour edge features heaps of grapes and tight tartness. Light barnyard aromatics bring in hints of earthiness and turf. A sweetness couples with dusty cellar aromas that show off both the aged Lambic and the young Lambic involved in this artisinal blend. A light metallic sheen hits on the end and a mineral water hardness rounds out the nose. Cheek-pinching sourness enteres up front, but it does not overwhelm the palate. As the beer hits the back of the tongue it delivers a funky sour punch. Light grapes and moderate fruitiness are featured prominently on the mid-palate. Dry sweetness with a light sugary edge are pervasive, but the beer's seche character dominates. The tart, highly carbonated beer is reminiscent of a Champagne and delivers a refreshing balance that at once seems to quench thirst, but leaves the mouth dry, inviting another sip. This beer exudes both subtlty and refinement and bold outstanding flavor. A true craft worthy of highest praise.